Back when I was a child, when going to the library didn’t involve a due date slip coming from a receipt printer, or being able to request books via the internet, I used to ride my bike there once a week, and fill my backpack to bursting, but I don’t really remember what my first book was. I know that when I was very young, I read a lot of Hardy Boys and Nancy Drew mysteries, that I borrowed all the Little House books before I owned my own, and that I probably read all of the Pern novels that way as well, but I don’t really remember what I checked out. The same goes for what I bought…I mean, I was blowing my allowance on books when everyone else was buying clothes and makeup, and that was another special weekend ritual for me, but…I don’t really remember what I bought first. I do know that even though I LOVE my kindle, there’s nothing like walking into a bookstore with available cash and weekend to fill. How about First Editions? Are they something special? Or “just another book” to you? Since the nice folks at BTT didn’t share a prompt this week, I’m answering one that I skipped. So, First Editions. To be honest, I’m not a used book fan. I think used books are much akin to used gym equipment in that they serve a very important market, but it’s not a market I’m in. For me, there is nothing better than cracking the cover on a brand new book, with no one else’s cigarette smoke or mothball scents trapped in the pages. On the other hand, I do recognize that first editions are potentially valuable, and I do have a small collection, including one Arthur Conan Doyle volume that a friend gave me. It was an incredibly generous gift. Who would you rather borrow from? Your library? Or a Friend? And, DO you return books you borrow? I could not begin to tell you what diet pills really work but I can tell you that my friends and I share books all the time. What I like about this is that we’re generally lending or borrowing books that we like – they come with the Friend Seal of Approval. What I don’t like is that I have a dog who sometimes steals books and gnaws on them, and I live in terror that he’ll do this with someone else’s books. Most of my friends are good about returning the books I want back, and passing on to others the books I enjoyed, but have no need to re-read. As to libraries…as a child, the public library was one of my favorite places on earth. In one town, the librarian often had several of us kids over to play at his house, with his girlfriend’s son (it was the 70’s…hanging with the librarian or your preschool teacher wasn’t alarming, then). As a young adult, I also frequented the library, often with my mother, later with my husband, but he’s so bad about returning books that it’s expensive and embarrassing. Also, our local library is pretty awful. Oh, I mean, it’s pretty, and there’s free coffee and a bunch of comfy chairs, but the collection is appallingly bad in the branch near our neighborhood, and the main branch smells like old people, and not in a “I love you, Grandma, you smell like roses” way, but in a “this could be a really bad nursing home” sort of way, and it’s dark, and has miles of empty shelves, and it’s just too SAD to go there. And, in truth, I get enough quiet working at home as a writer, so when I go out I don’t want to go to a place where anyone thinks they have a right to shush me. 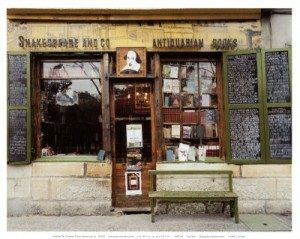 Bookstore-cafes, where there are lively discussions and froufrou espresso drinks are MUCH more my style.